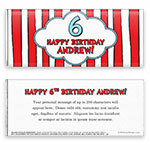 Inspired by a Dr. Seuss classic, this delightfully wonky striped candy wrapper will bring smiles to your celebration. 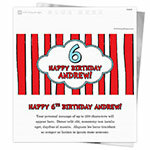 Design: Red and white Dr. Seuss-inspired stripes with cloud frame and number. Personalization: Front number, greeting and back title and message.